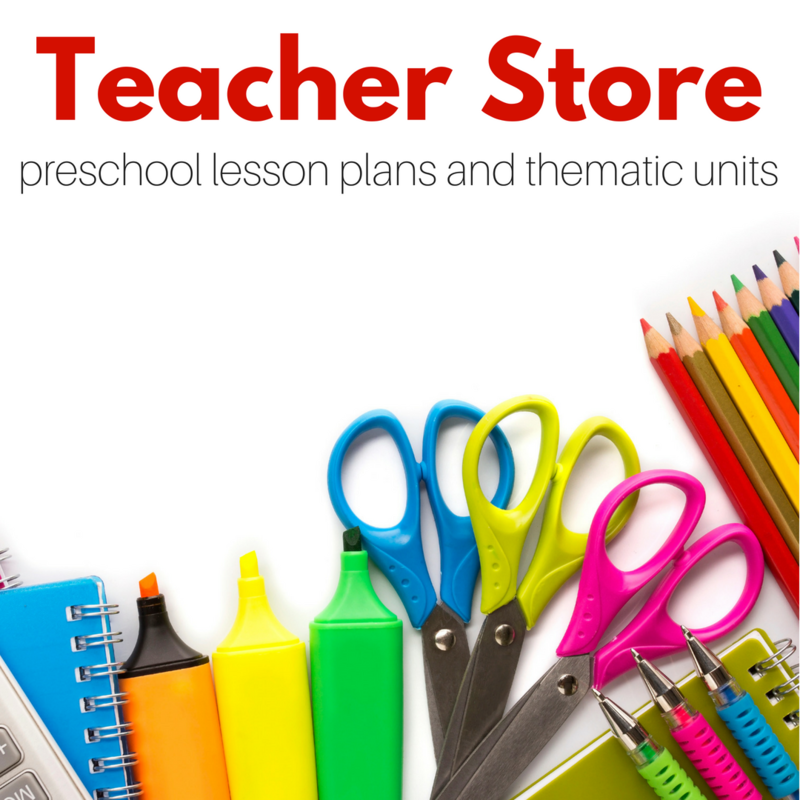 Pretend play is one of my favorite ways to teach. 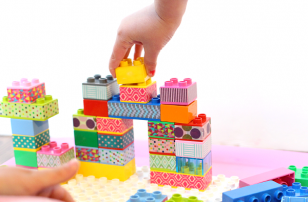 Kids love to pretend and test their limits within boundaries of make believe. 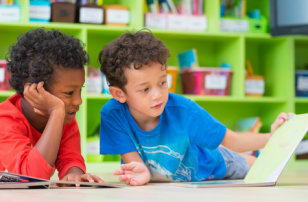 Combining pretend play with math is a great way to challenge your kids without making them feel like it’s a test. 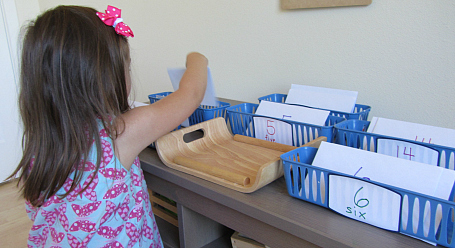 Pretending to be a postal worker gives the task of sorting meaning and with that meaning their learning is deeper and better retained. It’s also really fun. I left this set up for a few weeks and my kids, especially my daughter played with it over and over. Gather your materials. 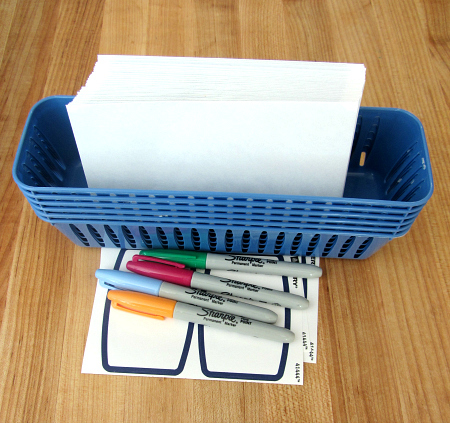 You will need some baskets ( 3 for a buck at the dollar store), envelopes, labels, a tray or big basket, and markers. 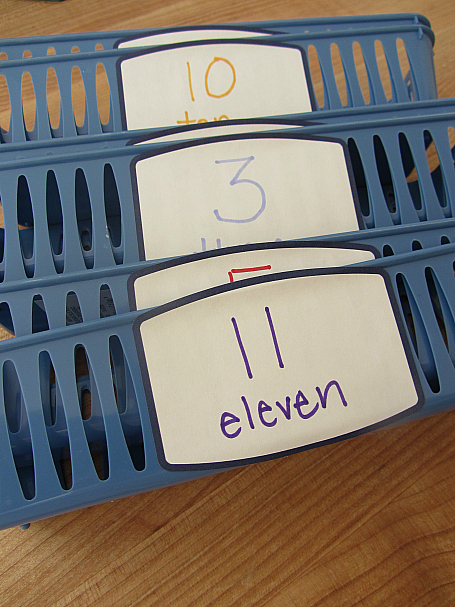 Start by writing out numbers on the labels. Next put them on the baskets. 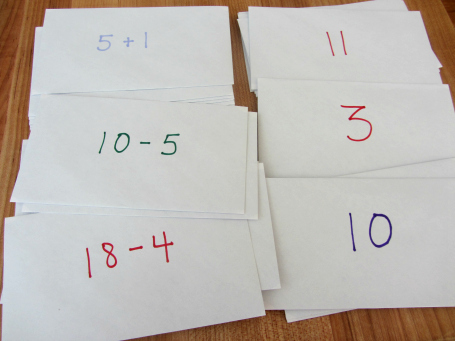 These will be used to match the numbers on the envelopes or the equations on the envelopes depending on your child’s level of understanding. 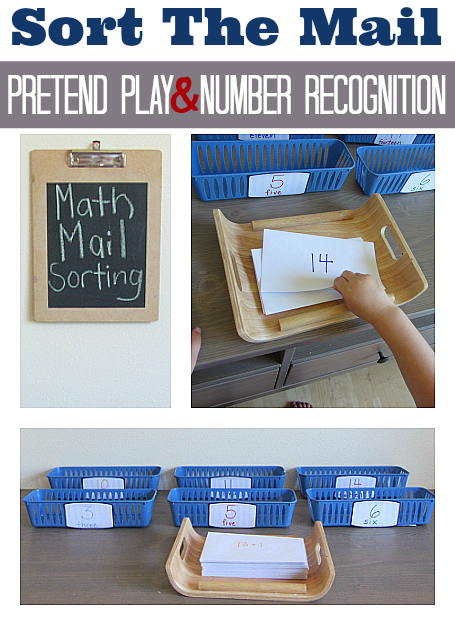 Write out the equations / numbers to match with the baskets. I did both, writing equations for my son and single numbers for my daughter. I had a few numbers I thought might be tricky for her and some equations that my son would have to stop and really think about. Set it all up! My son needed no guidance at all he sat down , read the little sign I added for fun , and got to sorting. Those few tricky ones slowed him down a bit but not enough to frustrate him or stall the fun. My daughter loved this . 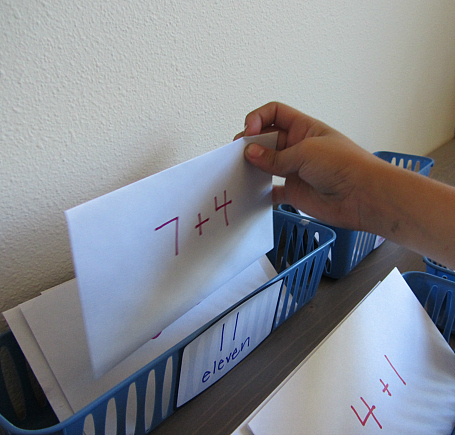 I switched out the envelopes with the equations with the envelopes with single numbers and she started sorting. 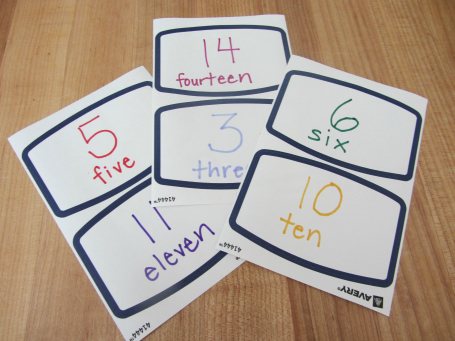 Unlike her brother she was totally vocal saying each number as she recognized it and sorted it into the correct spot. For little ones like her ( she is just 3) this is really important so we can step in if they need help. If they aren’t don’t push it , keep playing and modeling. 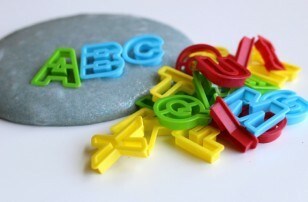 To take this further you can write letters with the numbers on them as well and add another layer of learning to the play. 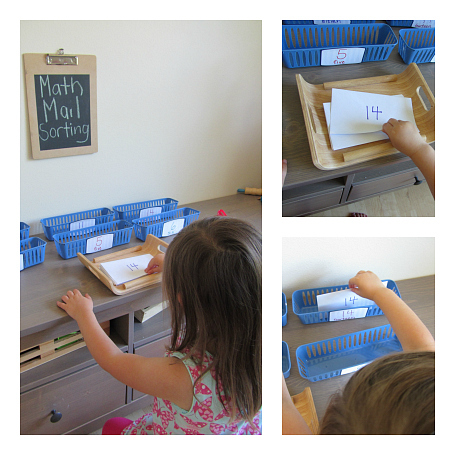 If you like this you will love our other post office play ideas like Alphabet Mail, Letter Sorting and of course our DIY Mailbox. This looks like so much fun. 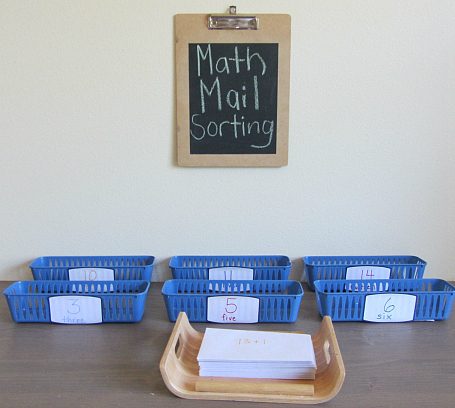 I have been wanting to do a mail sorting activity with my 5 year old, but I wasn’t sure what type of sorting to do. 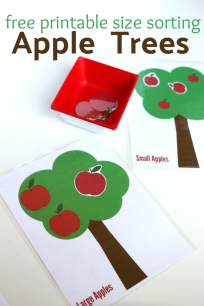 I think some very simple addition facts and numbered baskets would be perfect! Thanks for the idea.